A whole host of projects are working to speed up the process of turning small marine devices into commercial tidal arrays. 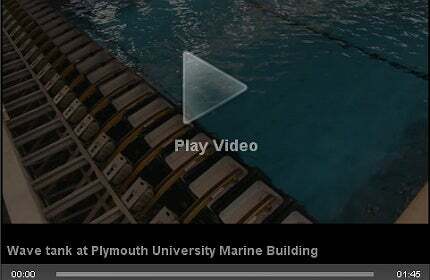 One such project is Plymouth University's Marine Building, home to the UK's most sophisticated wave energy testing tank, where local businesses and budding engineers have been experimenting with their new technologies. The Ocean Wave Basin at Plymouth University. Image courtesy of Plymouth University. The Duke of Edinburgh opened the Marine Building in October 2012. Image courtesy of Plymouth University. The Marine Building, home to 400 scientists, is Europe's largest marine institute. Image courtesy of Plymouth University. The UK marine power sector needs to go further, faster. Those were the words of Greg Barker, Minister of State for Energy and Climate Change, who spoke at the RenewableUK Wave and Tidal Conference in London last month. He said that now is the time to make "bold steps" in an effort to move individual projects to wide commercial arrays. And that is exactly what the industry and the government is doing. "Now is the time to make "bold steps" in an effort to move individual projects to wide commercial arrays." In just over a week, tidal companies MeyGen and SeaGeneration Wales have been awarded £20m in funding for their projects off the coast of Caithness and Anglesey; the Scottish Government announced it will provide £3m to the European Marine Energy Centre in Orkney, to enable the expansion of its testing facilities; and the UK’s two marine energy parks formed a working partnership to share industry knowledge between England and Scotland. Another key project to receive funding in February was the Marine Innovation Centre, being launched at Plymouth University to connect industry expertise, drive business growth and create jobs in the south-west’s marine and maritime renewable energy sectors. The £2m project will be based at the University’s Marine Building, which houses what is the UK’s most sophisticated wave energy testing tank. The £19m Marine Building, opened by the Duke of Edinburgh in October 2012, is Europe’s largest marine institute and is recognised as a centre of excellence for research, teaching and training. The institute is home to 400 scientists and specialists, as well as 2,000 students hoping to become tomorrow’s problem solvers in the wave and tidal sector. "The £19m Marine Building, opened by the Duke of Edinburgh in October 2012, is Europe’s largest marine institute." One of the key features of the Marine Building is the Coastal Ocean and Sediment Transport (COAST) laboratory, which offers equipment designed for device and array testing, environmental modelling and coastal engineering. The lab includes three tanks and flumes – the Ocean Wave Basin, Coastal Basin and Sediment Wave Flume – which differ in size and depth to produce waves of up to 0.9m in height. Students, along with researchers and small marine energy businesses, can carry out their experiments here. The first commercial testing at the lab was carried out by Offshore Wave Energy and IT Power in September 2012, ahead of the Marine Building launch. Their device will ultimately be deployed at Wave Hub, a grid-connected facility off the North Cornwall coast, in 2013. Since then, the WITT transmission system, designed to power navigational buoys and GPS systems, has been tested by WITT Energy, and this month, the Marine Building played host to the fourth wave energy experiment. Sea Wave Energy spent two days testing a prototype device that it hopes will generate energy from waves and work as a desalination plant for areas where fresh water is scarce. Video feature: are utilities ready for electric vehicles? Electric vehicles are becoming more popular among manufacturers and consumers, as the price of batteries drop and governments invest in new charging infrastructure.